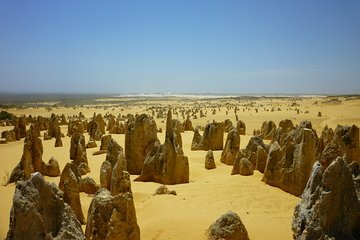 Not far out of Perth is the Pinnacles Desert, an otherworldly expanse of jagged limestone formations that stretches from the road to the horizon. Instead of finding your own way out there, get away from the city and enjoy a day full of activities on this private tour. Sample local wines and chocolate, take advantage of scenic photo opportunities at Thirsty Point and the white sand dunes of Lancelin, and spend an afternoon discovering the surreal Pinnacles and learning about their history. Professional driver-guide and informative commentary. Private transportation in a classy and comfortable fully air-conditioned vehicle. Pick up and drop-off from included from most centrally located Perth hotels. Live commentary in English, Italian, Spanish and Portuguese available. Wine and chocolate tasting included. Individual bottled water provide during the tour. Foldable wheelchair vehicle accessible. Person must be able to get in and out of the vehicle. Entrance fees to attractions unless specified in the inclusions. Departure location is from your accommodation, hotel or cruise terminal. Return to your accommodation, hotel or cruise terminal. A minimum of 2 persons is required for this tour to take place. Wheelchair (must be foldable) accessible. Person must be able to get in and out of the vehicle. Children 17 or under must be accompanied by an adult. Infants 0 - 3 are free of charge. Tours are available in English, Italian, Spanish and Portuguese.